2. Three groups of four players. 1. Player A passes to B and stays. 2. Player B receives and dribbles at Player C.
3. Player C applies passive pressure to Player B. 4. 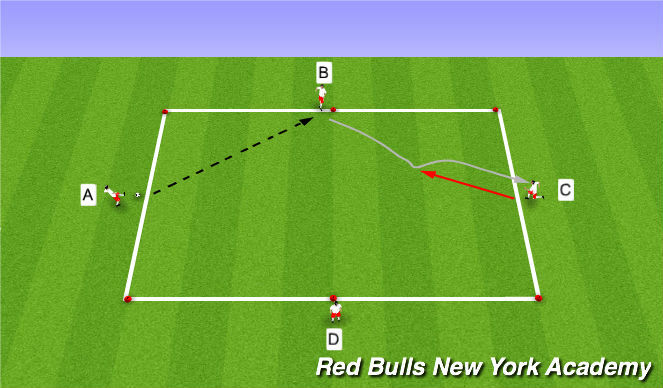 Player B beats Player C with scissors move and replaces him on endline. 5. Player C replaces Player B at middle. 6. Player B, now at endline, repeats process in opposite direction with Player D.
7. Player A pressures Player D in same fashion. 2. Connection - eye contact and verbal communication. 3. Receive on the move. 4. Receive on back foot. 1. 40x30 area with halfway line. 3. Two teams set up as shown. 4. Plenty of balls along outside. 1. 1v1 set up in each half. 3. GK starts the game by playing into either player. 4. A player from the team in possession joins in from the endline to create a 2v1 in the attacking half. 5. Play 2v1 to goal. 6. If the defending player wins possession, his team plays 2v1 in the opposite half. 7. 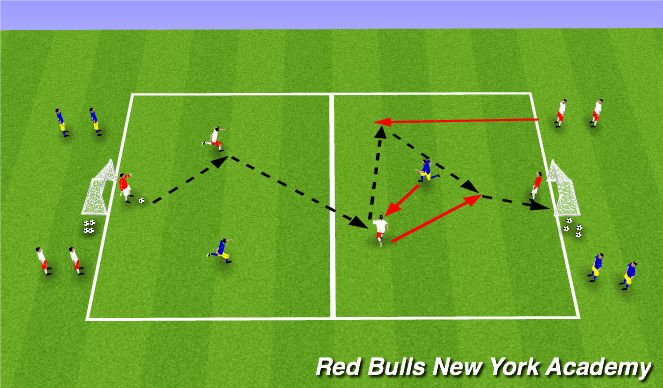 Restart with new players after a shot is taken, after a goal, or if the ball goes out of play. 1. Commit defender to the ball - role of 1st attacker. 2. 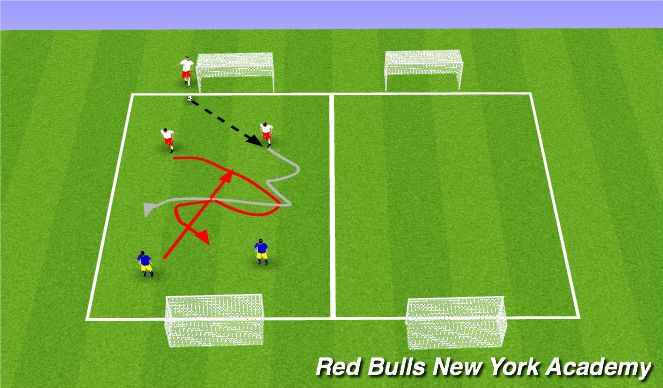 Move to support ball and/or create passing lane - role of 2nd attacker. 3. Angle and distance of support from 2nd attacker. 4. Movement to use passing lanes - role of 3rd attacker. 5. Decision-making of each player. 6. Selection and timing of combination. 7. Play at speed to take advantage of numbers up. 1. Allow free movement from defensive half following entry pass to attacking half.